Vowels are created by completely opening the vocal tract and allowing air to flow out unobstructed. What determines the sound of a vowel is the position of your tongue within your mouth. In the next section, you will tune your Portuguese vowels by listening closely to audio examples and adjusting your tongue up or down and front or back until the sounds match. To help in this process, you will first develop a physical awareness of your tongue's location in your mouth. You adjust the "Height" of a vowel by moving your tongue either up or down.. Do as the speaker in the audio below and alternate between "UUUU!" and "AAAA!" out loud to yourself. As you do this, try to develop an awareness of the direction in which your tongue is moving. When alternating between these two sounds, you should notice both your tongue and lower jaw moving UP and DOWN. Vowel Height Awareness by You should have noticed that your tongue and lower jaw have to move all the way down to create the "AAAA!" sound. Since this movement opens up the oral cavity more, we define this vowel sound as OPEN. On the other end, the tongue has to move almost all the way UP until it almost completely blocks the oral cavity to create the "UUUU!" sound. For this reason, we define this vowel sound as CLOSE. You adjust the "Backness" of a vowel by moving your tongue either forward or backward. To get an idea of this motion, do as the speaker in the audio to the right and alternate between the sounds "EEEE!" and "UUUU! ", trying once again to develop an awareness of the tongue movement. Here, you should have noticed that your tongue must move forward toward your teeth to make the "EEEE!" sound; we define this vowel sound as a FRONT vowel. To go back to the "UUUU!" sound, you have to retract your tongue back deeper into your mouth. As such, we define this vowel sound as a BACK vowel. The chart to the right is known as a "Vowel Chart." 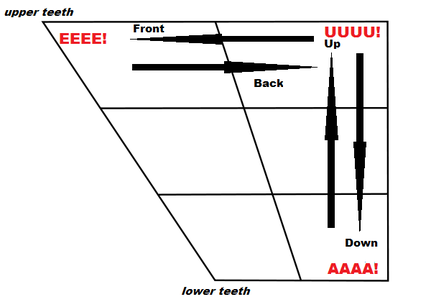 A vowel chart visually plots the location of a vowel within your mouth. The three vowel sounds reviewed on this page represent the extremes in Vowel Height and Backness. In other words, the remaining vowel sounds for a given language are going to occur at some point between these three extremes. In the next section, you are going to "tune" your vowel pronunciations by moving your tongue up, down, back and forward until they match the Height and Backness of each Spanish vowel. You will rely mostly on your ear to do this, but I can help you a great deal by starting you on the nearest English vowel and pointing you in the right direction from there. For this to work, however, you need to develop a sense of direction. To build your sense of direction, do as the speaker in the file to the right and alternate back and forth out loud to yourself: EEEE! ---> UUUU! ---> AAAA! ---> UUUU! ---> EEEE! ---> UUUU! etc. As you do this, look at at the vowel chart above and try to create a mental connection between the visual directions on the chart and the physical feeling in your mouth. Once you have this connection, you should physically know what to do when I say, "Your pronunciation here is too CLOSED; this vowel should be more OPEN." As you advance through the song lessons and submit audio recordings of yourself, this is the kind of feedback I will give you. When you think you are comfortable with everything on this page, move on to the next one to start "tuning" your Portuguese vowels. Once you have finished this page, move on to Oral Vowel Tuning.